Tributes have been paid to a British woman who was killed in a boating accident in southern France. Jess Wilkes, 27, from Kent, was flung from the craft as it travelled on the River Rhone near the city of Avignon, on Saturday night. Mother-of-one Ms Wilkes, from Lamberhurst, died and five other passengers were injured, two seriously, when their boat hit a warning beacon. An investigation has begun into how the crash happened. Eight friends, four French and four British, aged between 20 and 30, were on the boat, along with the captain. Ms Wilkes' brother Phil, said: "We are devastated to mourn the loss of such a loving daughter, caring sister and proud mother to Alissia, five. "She was a social butterfly who made everyone around her feel special and had an infectious energy and passion that she applied to everything in life. We love you dearly Jessica and may you rest in peace." Image caption Siblings Christopher, Jess and Phillip Wilkes. 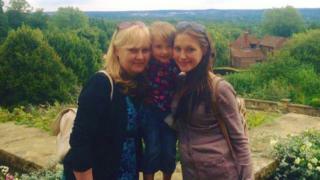 Caroline Bromley, head teacher of Alissia's school in Lamberhurst, said "this is tragic news, we're devastated". "Jess was a wonderful mother to Alissia," she said. "My heart goes out to Susanna and Bernard, as a parent myself, I can't imagine what they are going through losing just a beautiful daughter - and to all of her family. "As a school community we will wrap our love around Alissia going forward. "Jess was so full of life, she adored Alissia, she was always here for assemblies, school plays and dropping her off. She was a lovely person."